Bamboo hardwood flooring is available in many options, including strand bamboo flooring, horizontal bamboo flooring, vertical bamboo flooring, solid bamboo flooring, and engineered bamboo flooring. Bamboo floors are incredibly durable and are actually one of the most durable flooring surfaces in the world. Plank flooring is an attractive addition to any space, creating the illusion that the room is longer and larger. Bamboo wood flooring provides an attractive and traditional flooring option that looks great with any room’s decor. 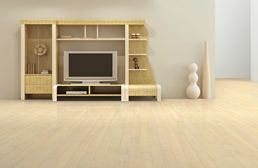 Some of us may have bamboo cutting boards, bamboo mats, or bamboo curtains - but who knew you can have bamboo flooring? Well, technically we do and you probably do now too since you are here reading this. So, bamboo flooring - most people think it is a wood, but (fun fact) it is actually a grass. Bamboo is so fast growing, durable, and abundant that it is a wonder it was not made into flooring decades ago. Bamboo is a beautiful and trendy flooring option that is renewable, making it eco-friendly. 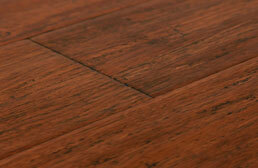 As if that wasn’t cool enough, it is also resistant to staining and harder than most hardwoods. 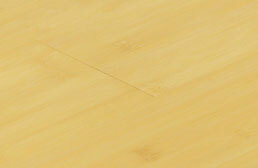 There are different processes to make bamboo flooring, which yield a different look per process. Imagine taking a bamboo stock, laying it down on the ground as is and “viola!” When you look at a horizontal grain bamboo floor, it looks very natural as if you were simply looking at a stock of bamboo right there - with “knuckles” and all. The knuckles are where two stocks come together, and this is an easy to recognize sign of which bamboo style your planks are. These stocks are flattened side by side. 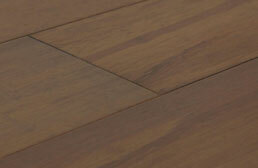 This produces the traditional bamboo flooring look. Of course there’s obviously a lot more to the construction of these planks, including heavy compression, drying of the bamboo, making it dimensionally stable, etc. Horizontal planks tend to be softer under foot and are recommended for regions with more moisture. Vertical grain has a different look than horizontal and is quite apparent once you see it. In vertical planks, you do not see the knuckles like you see in horizontal bamboo. This is because the bamboo stocks are compressed and rather than put side by side like the horizontal grain, vertical bamboo is put in more of a front to back layout. This produces a busier, more modern, and linear look. 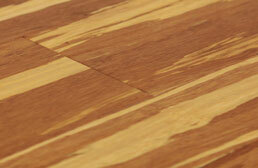 Vertical grain planks are also softer under foot compared to strand woven and are good in regions with higher moisture. This provides a look that is more reminiscent of a traditional hardwood floor, and not as “bamboo looking” as the other types of graining. Perhaps the name gives it away, but we will tell you anyway. 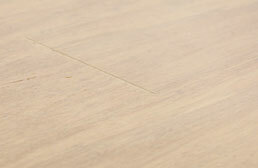 In strand woven bamboo flooring, strands are woven together, infused with glue, and compressed under heavy pressure. This process creates a plank with greater strength and durability than traditional bamboo, and is even harder than an oak flooring! This makes strand woven a bit harder underfoot, but it is also more versatile and can be installed in dryer regions. Solid Bamboo flooring is just that - a solid piece of plank. This means that from top to bottom you have 100% bamboo and it’s the real deal. Since the entire piece is solid bamboo and doesn’t have a middle core of another material, the floor can be refinished multiple times, enhancing the life and longevity of your beautiful floor. Solid bamboo also prefers a moist environment but is not recommended for installation below grade (in basements). Engineered Bamboo construction is very similar to that of an engineered wood flooring. Since engineered planks are more dimensionally stable that a solid, they can be installed on any level of the home, including basements. There is a piece of bamboo on the top portion of the plank, and multiple layers underneath of other wood types. Choosing an engineered is great because they typically have increased dimensional stability, strength, and ease of installation. However, if you plan to sand and refinish your floor in years to come, you may want to steer clear of engineered since they cannot be sanded and refinished as many times as a solid can. The bamboo wear layer on the top of the plank is much thinner compared to the thickness of a plank of solid bamboo. Solids can be refinished multiple times, but engineered are limited as you will eventually wear through to the core of the plank. If you are replacing an existing floor and need to match height with an adjacent flooring, the overall plank thickness will be important to you.Bamboo floors come in many thicknesses and you will want to pay attention so that you don’t have any crazy tripping hazards going from one room or one floor to another. Floor transition pieces can help to reduce some of this danger. Bamboo is versatile when it comes to how it can be installed. It can either be nailed, glued, or floated for installation. One other important thing that want to stress regarding your installation is acclimation: you must let your floor out of the box to acclimate to your temperature and humidity for days prior to the installation. Pro Tip: to allow your floors to properly acclimate, don’t stack boxes on top of one another - put them down side by side and also be sure to open up the ends of the boxes for best results. 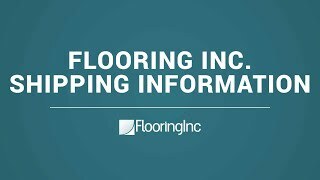 Another item we want to stress is the proper preparation for your floors: moisture barriers, underlayment, and consistency. As mentioned above, bamboo is very susceptible to moisture. So if you are planning to install over a concrete slab you will want to pat yourself on the back after putting down a moisture barrier. Without one, moisture could travel up through your subfloor and over time seep up into your bamboo planks, causing them to swell and buckle and wreak havoc in your room. A moisture barrier over concrete is a must. If you are easily bothered by noises, you are going to want to invest in some underlayment before you put your bamboo flooring down. If the floor is not adhered to the subfloor and you do NOT have an underlay, be prepared to hear all sorts of noises from below your feet. Not really, but there is a definite possibility you’ll hear a hollow sound underfoot. A quality cork underlayment would also provide warmth underfoot as well as sound reduction. We recommend our Eco-Cork Underlayment as an eco-friendly, popular underlay option that is Made in the USA. Since bamboo is a living thing, it is susceptible to changes in temperature, humidity, and sudden moisture. It is very important that your home be consistently controlled in humidity and temperature as to not cause the bamboo to react. Such changes can include a sudden dryness which can cause the planks to shrink and show gapping, or increased moisture which can cause the planks to swell and buckle or raise into each other. Make sure to follow the specific guidelines set by the manufacturer of your chosen bamboo flooring so that you do not unintentionally void any warranty for the floor.